I'm from Cleveland Ohio. I moved to LA almost five years ago. Moving to LA was literally a dream come true. I worked so hard to get here all on my own. After doing a successful feature film “Never Escape”, I felt that in order to further my career I had to get to LA to gain more exposure for my future projects. Plus I HATE snow, so the palm trees and beaches make me feel like I'm in paradise compared to Cleveland weather! What inspired you to become a cinematographer? Was there a specific film, movie, director etc? It's crazy, I literally have been making movies my entire life. Starting as a kid with my parents video camera and my little brothers, we were known as quite a creative family. Honestly, there's never been any doubt in my mind that this is what I wanted to do with my life. I've always been so passionate about my creativity. Now working as a professional, I constantly go back to my memories of making movies with my brothers. We literally just loved doing it and my goal is to continue that love and passion with my current projects. We used to get such a kick out of showing friends and family our VHS masterpieces. What's exciting is now I can continue that feeling with bigger audiences! I have literally hundreds of kids movies I made with my brothers over the years. Lots of student films that really helped me learn editing and utilizing the computer. My first full film was based on a funny character we came up with in college. “Brice Stevens The Movie” was a 45min improv based comedy. This was a huge learning experience for me. Me, my best friend, and brother all directed, filmed and acted in the film. It was a lot of work but in the end I learned how to put a big project together and wanted to try it again. In 2010 I wrote, directed, shot and edited my first big feature, a 1hour 15min action thriller “Never Escape”. This was such a huge undertaking. I had so many people involved, dozens of locations, we built our own sets and cast over 100 actors and extras! “Never Escape” premiered to a sold out crowd of over 400 people and went on to be accepted into numerous film festivals and got a video on demand deal! This film really helped put me on the map in Cleveland and I continued to do award winning music videos, commercials and visuals for DJs. Next, the NBA’s Cleveland Cavaliers offered me a job to shoot videos for them and this was a dream job! I got to write direct and shoot in game videos and commercials that were seen worldwide. Eventually, I saved up enough money to move to LA and as soon as I got here I hit the ground running. My first big project was a music video for my favorite artist of all time, Chino the singer from Deftones! “Future Warrior” by Palms was such a big project for me. It was featured on SpinMagazine.com and received an overwhelming positive response. I've continued to do more music videos, commercials and visuals for DJs that have played at some of the worlds biggest music festivals. I also worked last year part time for Actors For Autism, teaching young adults with autism how to do post effects for movies. But I have to say my favorite project is now my newest film "Loss and Found"!! 2 years ago my best friend, my dog Russell Stover tragically passed away. I kept thinking there has to be some kind of reason behind it all. Why did I have to suffer such a tragedy? I got in an awful fight with my ex and she literally busted up my eye, I was covered in cuts from broken glass and she destroyed my apartment. Then 2 days later, I had to put Russell to sleep because he had a tumor causing blood to fill his lungs. It was horrendous and literally the worst weekend of my life. But through it all I stayed positive and got 10 more dogs adopted! I remember thinking when my first dog Munson got adopted when we were on the beach, “This seems like something out of a movie”. Then I would continue to share my story with all my friends and family and everyone was always so inspired! 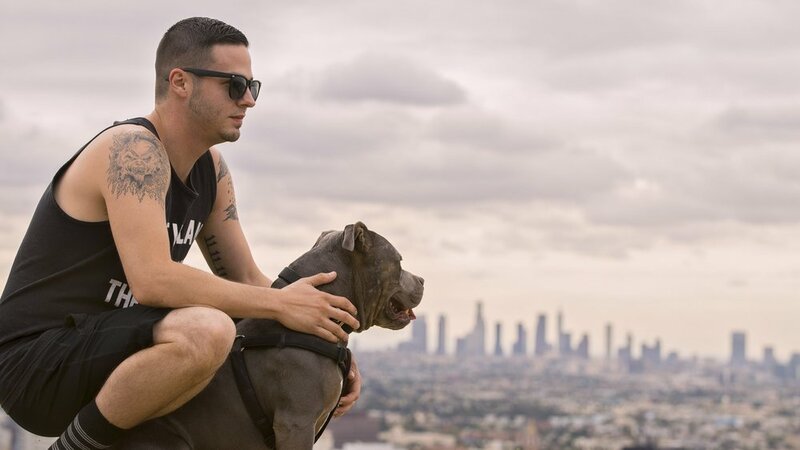 I was also amazed at how many people were unaware that you could foster a dog or adopt from a shelter, let alone the staggering number of healthy adoptable pit bulls that are put to sleep in LA every year. If I was going to do my story as my next film, I knew it had to be something compelling that would get into film festivals and help get my name out there. So one weekend I sat down and started writing it all out. It was a little tricky at first figuring out how I wanted to adapt my story and get so many details into a 22 page script. I think I also cried a million times while writing. Once it was complete it was such a good feeling. I actually think writing everything down and making it all into a short story really helped me in a cathartic way. I've gotten an overwhelming positive response to the film now that we have been screening in cities all over the US. Filming started in April with a cast of up and coming comedians and a great crew. 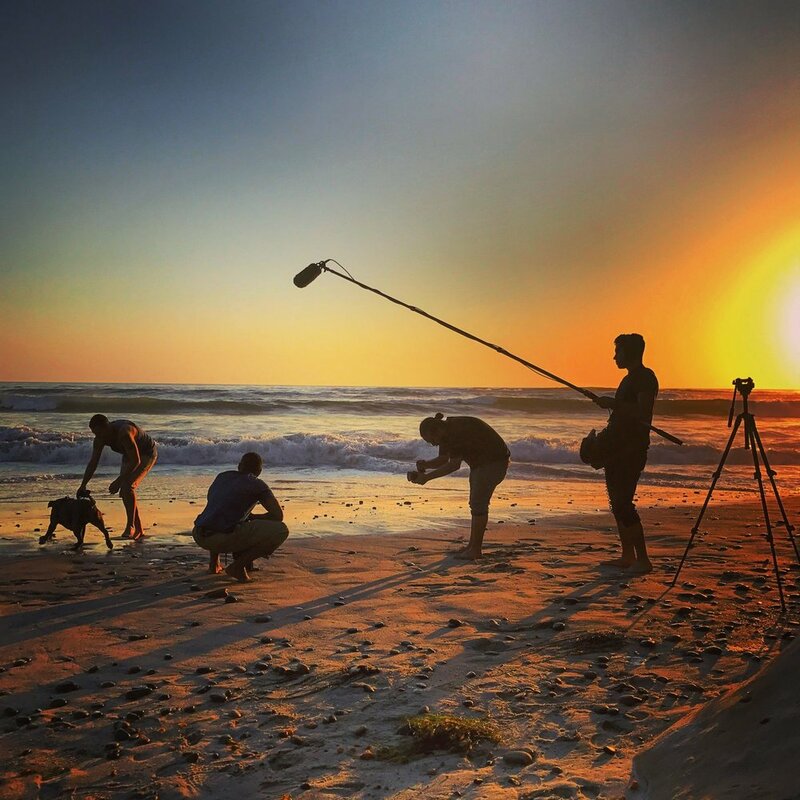 Since filming, Loss and Found has been shown at numerous film festivals and won the Audience Choice Award at the Huntington Beach Film Festival. 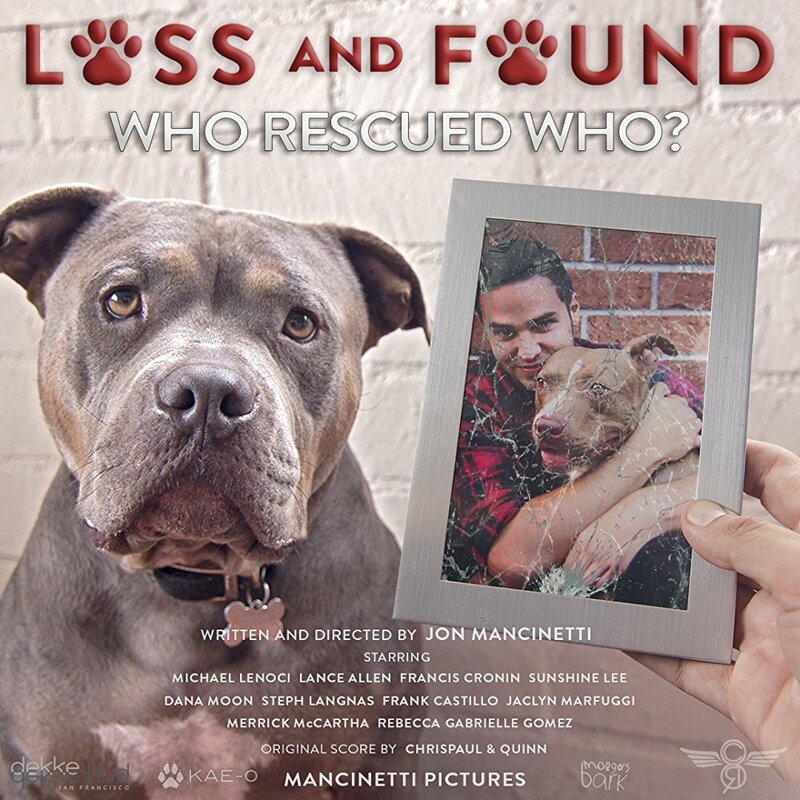 Although touring the country and showing the film wasn't originally planned, Jon hosted a benefit for the rescue he fosters for in Santa Ana and it sold out. With the overwhelming response, he realized that he had a voice and the opportunity to save more animals and help rescue groups. We’re really thrilled that you are coming to Buffalo to screen the movie. Have you ever been to Buffalo before? What are you most excited to see in the Buffalo area? I'm so excited to! I have never been so I'm excited to meet all the people, have some local food and drinks and celebrate this major accomplishment of sharing this impactful story with a great new crowd and maybe help some pups in need along the way. Well, my hope is that this film will allow me to continue to make my own films. Ideally this film will help showcase my writing and directing skills and help me go on to work on larger projects. I think it could be a great tool to help me get a budget to make my next major project. I might make Loss and Found as a full feature film, maybe do more shorts, or even a script for a feature I've been working on for years called "Epic Fail". It's the story of a failed comic book artist who lives in his parents basement, and can't catch a break but somehow has a chance to save the world! As far as my rescue efforts, I've been using this film as a tool to educate people in a fun way. It's a great way of getting the conversation started. Also, through the success of the film, I can use this to promote more dogs at the shelters who need forever homes. Smokey is my dog, we think he will be turning 5 soon. I adopted him a year and a half ago from Carson Animal Shelter. His last owners dumped him there after having him for 3 years. One of the biggest kill shelters of his breed (pit bulls) in Los Angeles. Maybe they didn't know but fate brought us together! He was the only dog the shelter would let me see that day and even though he barked at me from inside his cage I still gave him a shot. He was so friendly and playful as soon as we took him out. I ended up adopting him AND decided to use him in my film Loss and Found. Although we call Smokey by his name in the film, Smokey is actually playing the role of my first foster dog Munson in the film. Since Loss and Found is the story about the first dog I ended up fostering, I needed a good dog to play that role that would listen and be good on camera. Smokey killed it and did an amazing job. He's a famous dog now! He was even featured on the Hallmark channel with me! Jon has had a number of foster dogs over the years including Munson (played by Smokey), Duncan, Moose, Chunk, Dodger, Tucker and Wiley. His latest foster, Wiley, he had while filming Loss and Found and found a home following the premiere. Anything involving dogs, haha. I enjoy hanging at the beach, hiking, going out with friends. My best nights though are Netflix and Chill with my Smokelog by my side. (I call Smokey Smokelog because when he falls asleep next to me it's like having a massive log next to me haha) I have always loved expressing myself creatively. I love to draw and DJ for fun. I make my own mixes of all different instrumental beats I find on Soundcloud and enjoy listening to them when I'm working. I'm an extremely passionate guy and this film is something I'm so passionate about because it's based on my own life experience! Like I said, I have had such an amazing experience with all of the dogs in my life. They all show me so much love and really help me get through life. They cheer me up everyday and bring me so much joy. All I want is the opportunity to bring that same joy to more people while also saving dogs! LA puts over 200 pit bulls to sleep a day in the shelters! 1 out of 600 brought to the shelter system actually makes it to a forever home! After visiting the shelters and seeing these sad dogs that looked just like Russell, I knew I needed to get more involved. I think because I am such a passionate guy people really do look up to me and I have recognized that through all my work with rescue dogs and posting on social media, I now have a strong voice! And these poor animals need a voice! They need more people to help them and help educate more people so they can get involved. Just think how many I will be able to save by continuing my work and getting more and more exposure. All in all, I know for a fact that this film is the story that I am meant to tell right now in my life. We need it now more than ever if we are going to effect positive change in the world and start saving more dogs. When I’m promoting this film, the main thing I want people to know is this. Yes, this is a film that I will be making and promoting my talents and furthering my career, but ultimately I am making this film because I believe that it WILL help raise awareness and save lives, both human and animal!! Want to help Jon spread his message? He's looking for sponsors to help offset the costs of this tour. Contact him at MancinettiPictures@gmail.com Any little bit helps! Movie or TV Show: Wow so many, Brigsby Bear (just came out and its so good!) 2001 Space Odyssey, The Sandlot, Ace Ventura, Dumb and Dumber, Jurassic Park, Adaptation, American Splendor, Up, Sin City, to name a few haha. Bar/Restaurant: I'm recently trying to eat vegan! Haven't eaten meat since November so anywhere that makes good vegan food I LOVE! Makes me feel great and I know I'm not contributing to any animal cruelty. Animal: LOVE wolves, elephants, snakes, DOGS!! Of course pit bulls. I've always wanted a husky! Food: I still love food that should be unhealthy but if its made vegan it's slightly better for you! haha, Vegan pizza, veggie burgers, vegan mac and cheese! mmmm I'm a fat kid at heart! Pup Crawl and Benefit for Fix-a-Bull WNY (Rock-A-Bully) and Diamonds in the Ruff Animal Rescue. Benefit screening of the Independent film Loss and Found to benefit Fix-a-Bull WNY (Rock-A-Bully) and Diamonds in the Ruff Animal Rescue. Starting at 5:00 PM the Pre PAWty night will begin at Canal Club 62 located at 62 Webster Street in North Tonawanda, directly across the street from The Riviera Theatre. There will be basket raffles & drink specials. The movie screening will begin at 7:00 PM at The Riviera Theatre located at 67 Webster Street in North Tonawanda. Meet the filmaker Jon Mancinetti! After the premiere of Loss & Found everyone is invited to The Dockside Bar & Grill, located at 153 Sweeney Street in North Tonawanda, to continue the evening’s events. There will be drink specials, raffles & a red carpet. Every ticket will include a 15% off coupon for food purchased at Canal Club 62 and The Dockside Bar & Grill. 100% of ticket proceeds will be donated back to the cause.